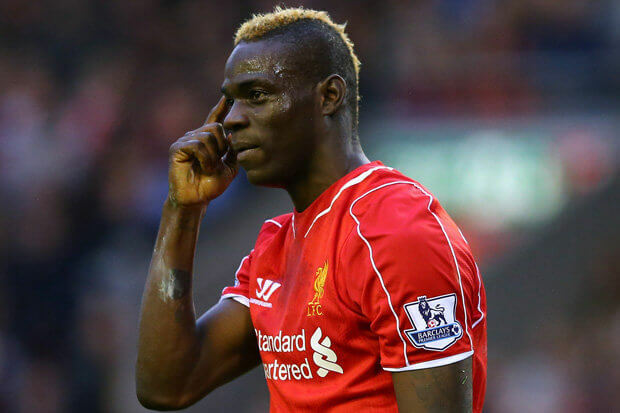 There’s news today that Newcastle are interested in signing Liverpool’s Mario Balotelli on loan for next season. The 24 year-old Italian International seemed to be a lot of trouble for Liverpool last season, and Mario did not have a good time of it at all on Merseyside. The 33 times capped International (13 goals) scored only 4 goals in 26 appearances last season, and he was not a good replacement for Luis Suarez who had joined Barcelona last summer and ended up winning the Champions League. We suppose it had to happen – that Mario is an available striker who Liverpool are looking to offload – and Newcastle are in the market for strikers this summer, but we don’t know if this story is true. Certainly Mario is a challenge for any manager as Jose Mourinho found out when he had him at Inter-Milan, and said at that time he was unmanageable and Brendan Rodgers found out last season he was a challenge. The news being reported is that at the Board Meeting yesterday on transfers, head coach Steve McClaren wants to get him in on loan at Newcastle next season. We’d be very surprised if that statement is true – because it suggests that Newcastle are already panicking with a full two months to go in the transfer market – that’s simply not true. It’s more like a made-up story, and that comment is what Newcastle fans feel at the moment, which further suggests it’s fake. We’d be very surprised if Newcastle want to take on the (huge) challenge of managing Mario Balotelli next season, although he’s a gifted player. But maybe it’s all financially motivated and Liverpool are willing to pay Newcastle money to take him on loan? He makes managing Ben Arfa look easy, and let’s just say Balotelli’s personalty is antithetic to team spirit. 110k a week on Balotelli….he dropped 60k to join Liverpool, who were in the CL, anyone reckon he will drop another 60k to join NUFC who are fighting tooth and nail for top 12? Winnersports, the most reliable source since the Daily Star. he is a risk but i’d take that risk, quality player on his day, if we got him we’d still need another strike as you can’t always rely on him. Hahahaha what a crock of shite ! Apparently Mario’s agent is dead set against him leaving Liverpool . A compromise could be found with a seasons loan to us. Surely if we can pay Facundo Ferreyra 1.5 million euro for what he gave the Toon , Mario’s worth a punt at 6million euro . Oh yes, you can imagine Super Mario out for a quiet cuppa and a piece of cake in Fenwick’s caff eh? What a handful – thank you Mr Rodgers, but another time perhaps. Ed…when is the Evans article coming up? TheTyne & Wear fire chief wouldn’t have enough fire fighters to cope with MB. well, things have been a bit too quiet recently, no controversy. we clearly need someone who is going to bring some negative headlines and ensure the club continues to be a laughing stock of the PL. No way! This must be a joke. Most overrated celebrity in football ever! Safer – just before Ed can re-type one of his old Barberry ones, be patient it’ll come. Mr T – on Elliot, I thought he was a reasonable understudy, especially when you consider what happened with Alnwick. He can throw better than Krul. Actually he can kick better. Javier Hernades is a beta bet. Than that crazy man. Javier Hernandez has broken his collar bone apparently, so I don’t think he will be going anywhere. They have to get a striker from somewhere – we now have to try and compete with Bournemouth for Charlie – thats most unfair on poor Penfold!!! Lads, it’s not time to panic yet. Harrumph. We have a lot of players who will be like new signings. There’s what his name……err Marvelous? He will be like a new signing. And there’s De Jong…. he will be like a new injury prone signing to go along with wor old injury prone signing Saylor. And then there’s Tiote…… with Steve in the Toon he will be like a new signing. So you see we already have a fabulous new squad. And you lot were worried. Imagine actually working with a ball this early in pre-season? It’s unbelievable. Last summer we started with a week of work on the sausage rolls. Remember how good Ben Arfa looked afterward? Beautiful. Firstly the story is a croc of shite. Secondly, why do we even need to entertain the idea of players on loan unless there is an option to buy. The reason we won’t sign Austin is because he is pretty much at peak value now, if clubs are stalling at paying 15M now they will not pay 20M+ for him in two years time. Therefore despite us needing goals he’s not the right type of character. Have we actually got Ian Coldcuts yet? Is he helping introduce wor players to a football? Is he telling the lads what good footballers in Spain look like? Or even what they play like? I hope so. Get in there with your fongbat Ian. its because they have all been playing with themselves in their offices that all our main targets are getting bought by other clubs willing to pay what they are valued at and we have very little other options ! so ofc its avg at best players either bought or on loan that should be enough to keep us in the prem……just. The Book of Low Bids strictly forbids offering what the other club are asking Jail mate. We can only offer 2/3 of the asking price, max. So we have to wait until Charlie comes down in value….. and then underbid that new value. It’s all a bit complicated. I can’t go into the details but what it really means is we won’t be signing Charlie until he’s about 42 years old….Harrumph. the only think fat man has changed here is he’s got a better coaching team to increase the avg players we allready have’s value so he can line his pockets even more ! Feccundo Fererrya….need I say more? You see? Now let’s have some proper comments on here about wor Lee!!! Harrumph. Gotta say I’m no balotelli fan, but if it’s him or nobody, I would save the money and heartache , you could get a couple of players and wages for the cost of his wages for a year … And even if they never play for the 1st team they will probably be less hassle and score the same as Mario. Let Schteeve loose with the players we have (add a few new ones who can kick the spherical thing in the net more than 5 times a season) give him time and let him work his tactical genius magic ( like he did at boro , letting the opposition score 3 goals, put 4 strikers on the pitch and hoof the ball to one or all of them and get 4 before extra time finishes) can you imagine carvew or fraudew ever having 4 strikers on the pitch cos I can’t, maybe 4 strikers on the pitch in a single season but not a match. i’m sorry i stand corrected. Tsunki – if you could combine the attributes of Elliot and Krul – you end up with a good keeper. Your right that Elliot has miles better distribution than Krul. I just don’t think he is the type that commands the box -just the opposite. error – your = you’re. How about a cheeky 2M pound bid for Nani? That might be exciting. Come on Lee, have a go!!! but derby…..derby…lol we cant even compete with derby !!! someone please slap me i’m going into hysterics here. That’s all right croftus mate….Harrumph. A lot of people are failing to realize what a top, top MD we have in Lee.